24 -27 May 2017, La Rural. The exhibition Kollision. Im Labyrinth der unheimlichen Zufälle postulates a renaissance of a surrealistic aesthetic. The curators, Conny Becker and Maria-José Ourtilane, recognized that more and more contemporary artists use techniques that were introduced by the Surrealists (frottage, collage, decalcomania, rayography, écriture automatique etc. ), or are inventing similar experimental artistic forms. Furthermore, you can find a parallel regarding similar themes (the phantasmagoric, the uncanny, the supernatural). In a climate of uncertainty and confusion of our globalized societies, human fragility takes centre stage again. It seems, that many artists deal with the permanent hyper-information in a way that refers more to the inner than the outer life. Kollision will be running from April 1st to June 26th 2016 in Kunstraum Kreuzberg/Bethanien, Berlin, Germany. The curators invited more than twenty international emerging and mid career artists, most of them based in Berlin. The curators invited more than twenty international emerging and mid career artists, most of them based in Berlin. Manon Bellet, Matti Isan Blind, DAS INSTITUT, Tatiana Echeverri Fernandez, Roland Flexner, Heike Gallmeier, April Gertler, Yunchul Kim, Birgit Krause, Alicja Kwade, Jan-Holger Mauss, Myriam Mechita, Jérôme Poret, Thomas Rentmeister, Roman Schramm, Michael Schultze, Ivan Seal, Heidi Sill, Henrik Strömberg, Claudia Wieser, Zoé T. Vizcaíno. 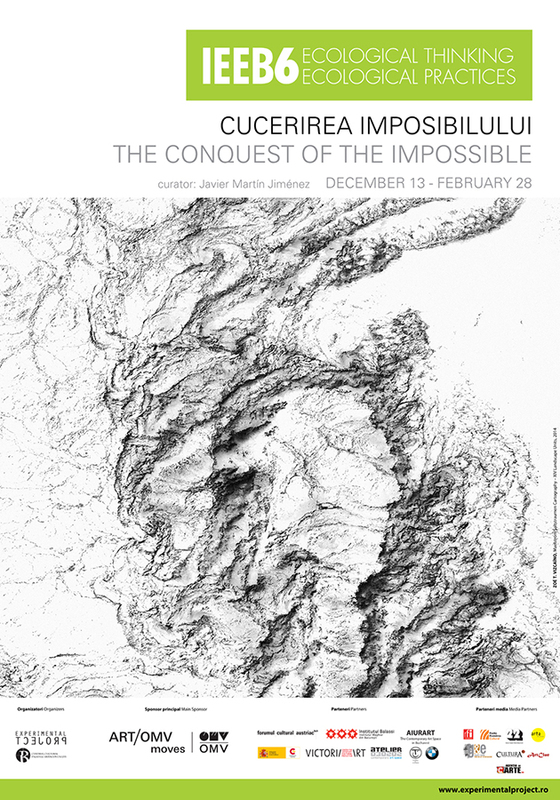 "The exhibition "The Conquest of the Impossible" will be hosted at the Mogosoaia Cultural Center in Bucharest and it will include an international selection of 16 artists. It will develop different topics as the spaces we inhabit, the concept of landscape and nature itself; the manipulation of the image of nature (political, commercial, military, etc); the sense of awareness of place and of care towards that which is native, both from a social and naturalistic point of view; a study on social geography and the concern with the uneven distribution of wealth or the importance of making an inventory of global resources; etc."